In a pot of boiling water, place potatoes and simmer until cooked. In a bowl toss the onion with vinegar. Let stand for 5 - 10 minutes. Add oil to onions and vinegar. 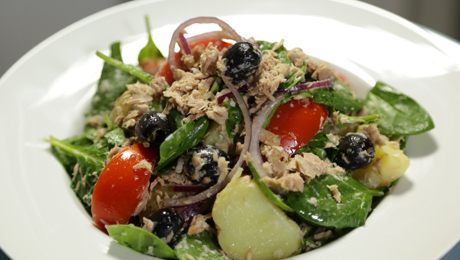 Toss the spinach, tomatoes, tuna, and olives with the onion mixture. Slice the cooked potatoes and add to the salad. Sprinkle the grated parmesan on top of salad.